There is no doubt that we are seeing (finally) some positive movement in our real estate trends reports. 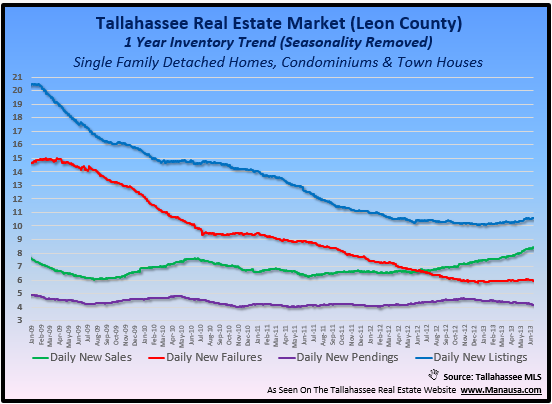 After many years of providing charts, graphs, and analysis of the Tallahassee real estate market during its fall from the peak, I must say that I look at the data each morning with baited breath hoping that our improving housing trends continue. And this morning, I was rewarded with more positive news. The following real estate trends graph is one that I look at twice each week as it provides a clear market snapshot. It is as functional as the instrument gauges on the dashboard of a car, it's the real estate trends that relate to the supply and demand of homes for sale in Tallahassee. So what exactly can we read from the graph above? First of all, each of the four real estate trends graphed above show a one-year trend, meaning that all seasonality has been removed from the data. This means we are not seeing something happen because of the time of year (each point on the graph contains 365 days worth of data), it is truly a trend in the Tallahassee real estate market. The amount of homes coming onto the market is on the rise (blue line). The amount of homes selling each day is on the rise (green line). The amount of homes failing to sell each day remains at 6 (red line). The amount of new pending contracts is on the decline (purple line). New Listings - The fact that the number of homes being listed each day is on the rise is a sign of a rise in optimism among home sellers that their homes can be sold. Tracking the blue line on the real estate graph from left to right shows that we are barely above 1/2 of the listings coming into the market each day as we were at the beginning of 2009. So, it's good news that home sellers are more optimistic, but we have to pay attention to the price ranges that are still far over-supplied for the current rate of demand in the Tallahassee housing market. New Sales - The most exciting of the real estate trends shown above is the home sales line. This trend is still far below where we need it to be, but home sales are occurring at the highest rate we've seen since 2008. New Failures - There will always be home sellers that fail, regardless of housing market conditions. The ones that refuse to budge on an unrealistic asking price have been around for as long as their has been a real estate market. The real question is "how many should fail?" While I do not have an answer, I would say that our current failure rate is still far too high. Currently, each day, 8 homes sell while 6 homes fail. New Pendings - Pending home sales are homes that are "under contract" waiting for closing date. The results in the real estate trends graph above do not make much sense without further explanation. You might be wondering why new contracts are on the decline, yet new closings are on the rise ... how can this be? This is the result of a change in Realtor behavior and the use of the MLS in Tallahassee. Historically, we did not have many short sales (which often are under contract for many months), so we (as a group) had a tendency to report contingent contracts as "pending." Nowadays however, we see most contracted homes sporting a "contingent" status and most Realtors do not get around to changing these properties to pending. Thus, homes see their status got from "listed" to "contingent," to "sold." I cannot go back in time and record the contingent status, so we'll just have to recognize that our measurement is not one of the key real estate trends until short sales are purged from the market. If you are thinking about selling a home, you should keep an eye on these important real estate trends. Just like anything competitive you will ever do, it is important to know what your competition is doing. A real estate trends report for the overall Tallahassee housing market is typically not specific enough for you to make intelligent choices. You would be better served having one performed for homes very similar to yours in areas very similar to where your home is located. If you would like to have the world's best real estate trends report prepared for your home, just drop me a note and we can schedule a time to analyze your home selling options.